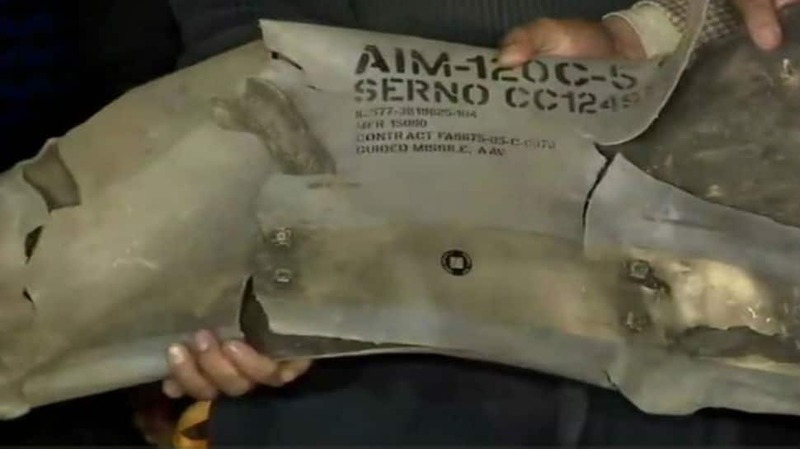 IAF presents part of missile fired by PAF's F16 jet as evidence. NEW DELHI: Pakistan has denied F16 fighter jets were used when PAF aircraft crossed into Indian airspace - a lie that was nailed by the Indian Air Force on Thursday. This was shortly after an under-pressure Imran Khan announced that the IAF pilot in Pakistan's custody would be released. Earlier in the day, Pakistan fighter jets once again attempted to enter the Indian airspace but were thwarted back. Pakistan's ground forces have continued to violate ceasefire along the LoC. The Indian armed forces, in a briefing, said that the Indian Army, Air Force and Navy is absolutely ready against any Pakistani adventurism. Government bans Jamaat-e-Islami in Jammu and Kashmir. "Once the ordinance is issued, it would pave the way for bringing persons residing in the areas adjoining International Border within the ambit of reservation at par with persons living in areas adjoining Actual Line of Control." PTI quotes an intelligence report as saying that JeM has vowed to continue with their anti-India agenda. So, what is an AMRAAM? Click here to find out. IAF showcases part of a missile from Pakistan Air Force's F16 fighter jet. Air Vice Marshal RGK Kapoor says this is a part of AMRAAM, air to air missile, which is carried only by PAF's F16 jets. He says it was recovered from Rajouri. * The Indian Navy is alert and ready for any challenge to our maritime border from Pakistan. We stand as one. * We are ready for any misadventure by Pakistan and we are ready for resolute action. We want to ensure safety and security of our citizens. The Indian Army is in a high state of alert. Pakistan has repeatedly violated ceasefire across LoC. The ceasefire violations are taking place even now as we speak. As long as Pakistan continues to harbour terrorists, we will continue to target the terror camps. Indian Air Force welcomes the decision to return our IAF pilot, says Air Vice Marshal RGV Kapoor. * On February 27, at around 1000hrs, IAF radars detected a large number of PAF jets heading towards Indian territory. They breached Indian airspace west of Rajouri. IAF fighters were tasked to intercept intruding Pakistan aircraft. PAF jets attempted to target our military installations but IAF jets intercepted them. PAF bombs fell in Indian territory but were unable to cause damage. * A PAF F-16 jet was shot down and it crashed in PoK. A MiG-21 also crashed and its pilot ejected safely but in PoK. * Pakistan has made several incorrect statements. They said 3 IAF jets were shot down but was later revised to 2 jets. Pakistan later changed statement to say one IAF pilot was in their custody. * Secondly, Pakistan claimed they intentionally dropped bombs in open spaces. Fact is they targeted military installations and were intercepted by IAF jets. They were unable to cause any significant damage to our military installations due to a swift response. * There is enough evidence to show that F-16s were used in this mission through their electronic signatures. Parts of AMRAAM, air to air missile which is carried only on the Pakistani F-16s was recovered east of Rajouri within the Indian territory. Whole nation will be relieved. I hope our leadership will also reciprocate this peace gesture. I hope Imran Khan will stand by his word and take steps on Indian dossier on Pulwama attack. I'm very happy, I had demanded his release earlier too. This is going to be a step towards goodwill and I hope this will be lasting. Sources say NSA Doval will meet PM Modi and update him on today's developments. Joint press briefing by Army, Navy and Air Force in New Delhi has been postponed to 1900hrs. How India's tough message forced Pakistan to announce IAF pilot's release - read here. Speaking in his country's parliament, Imran Khan said that the pilot would be released as a peace gesture towards India. "The release of the pilot is the first step towards open negotiations," he said, while confirming he would call Prime Minister Narendra Modi later in the day. Pakistan announces it will release IAF pilot in its custody tomorrow. Manish Tiwari of Congress accuses PM Modi of addressing booth workers of BJP instead of addressing the nation. MEA briefs diplomats from 10 countries, including Germany, Nigeria, South Africa and Belgium, on prevailing tensions between India and Pakistan. Sources say that 20 PAF jets had crossed into Indian airspace on Wednesday (February 27). When asked if Pakistan Foreign Minister SM Qureshi is open to meeting Indian EAM Sushma Swaraj on sidelines of the Organisation of Islamic Cooperation (OIC) meet, he told geo news that he will not hesitate to meet but OIC is not the forum for talks with Swaraj. "India didn't consider giving actionable intel earlier as Pakistan did not act in past on actionable inputs on Mumbai and Pathankot. Terrorists were caught, audio given, access given to forward posts in Pathankot. Pakistan remained in denial. 13 days after Pulwama, they still deny JeM role," the source added. Pakistan violates ceasefire in Rajouri's Nowshera Sector at about 1415 hours today. Indian Army is retaliating. "We are ready for talks on Kartarpur. They (Pakistan) had called it off just as they had closed airspace and stopped Samjhauta Express. We are trying to appear reasonable, they are creating a war hysteria," say sources. "Pakistan has lied to international community on Jaish-e-Mohammed, about two pilots in custody. They lied on Indian ships approaching, they have lied on missile strikes," the source added. "India did not target any civilians or military installations, but Pakistan escalated by targeting Indian military installations. India did not deliberately cross LoC, very strong demarches have been given. India has foiled Pakistan's attempts at creating a war psychosis," sources tell news agency ANI. When asked if Pakistan PM Imran Khan and PM Modi will talk, the sources said, "Immediate, credible and verifiable action against terror is required before any such conversation. Imran Khan should now walk the talk on dealing with terrorism. That is our message to Pakistan and International community." Pakistan Foreign Minister Shah Mehmood Qureshi on Thursday said Pakistan is willing to consider returning the Indian pilot if it means de-escalation. India asks for immediate release of Wing Commander Abhinandan, not consular access. A high-level meeting with National Security Advisor Ajit Doval, three service chiefs, top RAW and IB officials currently underway in the national capital. Two Pakistan jets violated Indian airspace in Krishna Ghati sector in Jammu and Kashmir's Poonch on Thursday afternoon. However, the Indian Air Force chased the jets out. Authorities are yet to confirm the same. The airspace violation comes hours after Pakistan's ceasefire violation with mortars earlier in the early morning hours. It once again opened fire after around 1 pm. The enemy forces fired mortars across the Line of Control in the Krishna Ghati sector. "We believe that the Pakistan air intrusion was an attack on military installations. We believe that the Indian Air Force Pilot was ill treated by the Pakistan Army in violation of the Geneva convention," Defence Ministry Officials tell news agency ANI. "We believe that the Pakistan Army is actively supporting the Jaish-e-Mohammed and is harbouring the leaders including Masood Azhar in its facilities," sources added. Indian Army and Indian Air Force to address a joint press briefing in New Delhi at 5 pm, Thursday. PM Narendra Modi says necessary to ensure nothing is done to dent morale of security forces. The country's heroic soldiers are showing their strength both on the border and across the border. The entire country today stands with the army: Prime Minister Narendra Modi mega interaction with Volunteers, Supporters and party Karyakartas from across the country. External Affairs Minister Sushma Swaraj has left for Saudi Arabia to garner support against support to terrorists by Pakistan. Picture of downed Pakistani Air Force jet F 16 seen in Pakistan-occupied Kashmir. 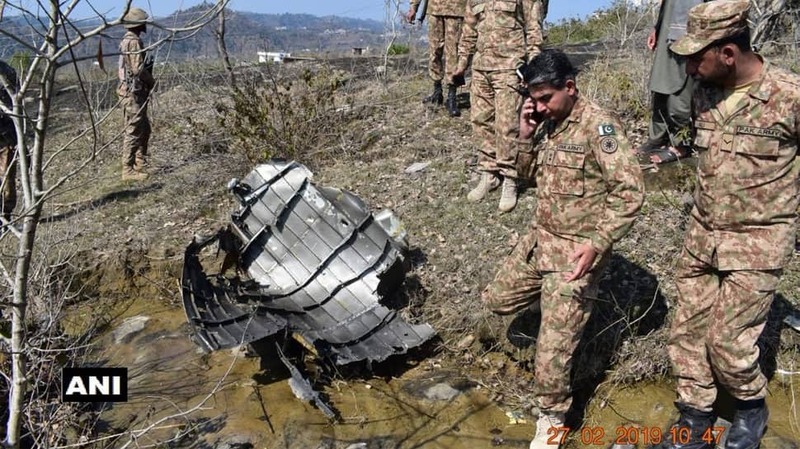 Commanding Officer of Pakistan’s 7 Northern Light Infantry and other PAF personnel were seen standing near the wreckage. The three service chiefs to meet Defence Minister Nirmala Sitharaman soon, say sources. Indian Navy and Indian Coast Guard are on high alert along the coastline of Maharashtra and Gujarat amid the escalation of tension between India and Pakistan, sources told Zee media. Navy and Coast Guard are both patrolling the seas with increased strength in vessels. Authorities are also checking fishing trawlers' documents. Security agencies have been asked to be extra cautious and alert with the stealth submarines of Pakistan which may try to operate within Indian territory. "Concerned about deteriorating situation in Kashmir. Strongly condemn terrorist attack on February 14 for which Islamic extremist group 'Jaish-e-Mohammad' claimed responsibility; urge Pakistan to take stronger measures to counter terrorism," Japanese Foreign Minister Taro Kono. "In response to the mounting tension due to the operations since 26 February between the Indian Air Force and the Pakistan Air Force, Japan strongly urges India and Pakistan to exercise restraint and stabilize the situation through dialogue," he added.